I love that scrapbooking have me opportunety to meet some amazing people. One of them is Denise Morrison - she and I met at Cocoa Daisy, and have become friends for life. She is that kind of person that inspire me both creatively and in her way of living life! I´m SO glad I have her as my friend. She sent me a mail the other day, asking if I was interested in a Virtual blog tour among other creative people. The purpose of the tour is that creative people get the chance to meet and connect. I absolutely love the idea and could of course not say no. How does my work differ from other work of it's genre? How does my creative/writing process work? At the moment I´m creating for a couple of my upcoming deadlines. I design for a mixed media manufacturer called Linnie Blooms, a challenge blog, a virtual enzine and the online store ScrapPlezier witch gives me plenty of opportuneties to use my creativity in different fields. I´m good with planning so at the moment I only have things that will go live in the end of June and the beginning of July. SO nothing I can show yet. When I work with a layout I often let the feeling in the photo set the tone of the composition of the layout. Like this one when I turned the back of the camera. The feeling is a bit sad, torn down and rugged. Or sometimes I have a pretty narrow frame to follow. 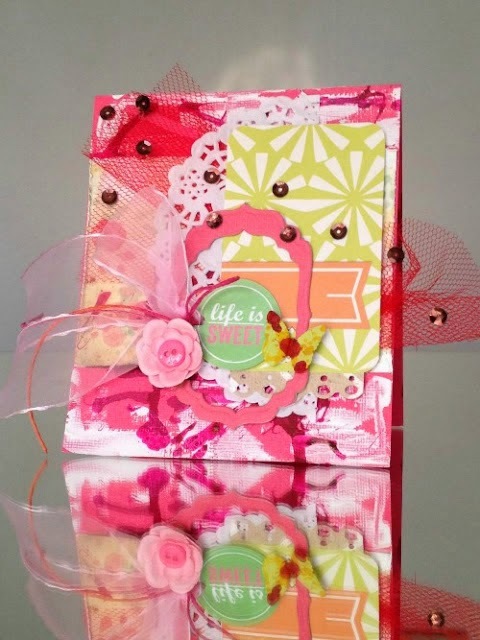 Like for this page made for a online contest and the given instructions was to use mononcromatic pink, chipboards, more than one photo and NO stamps. That is a pretty difficult question. Do I really have a style that´s just mine? One thing I love to do is playing with different techniques on all my projects. I use gesso on pretty much everything. And stamp with permanent black ink on almost everything as well. Maybe my style is that I don´t have a defined style. 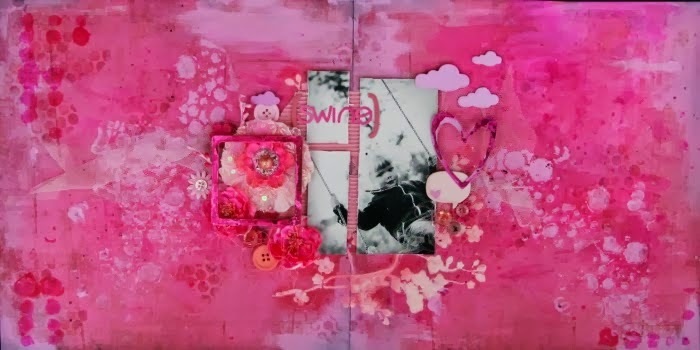 That I cross over between scrapbooking and mixed media? I love to incorporate mediums and techniques into projects that´s not typical for it´s "genre". 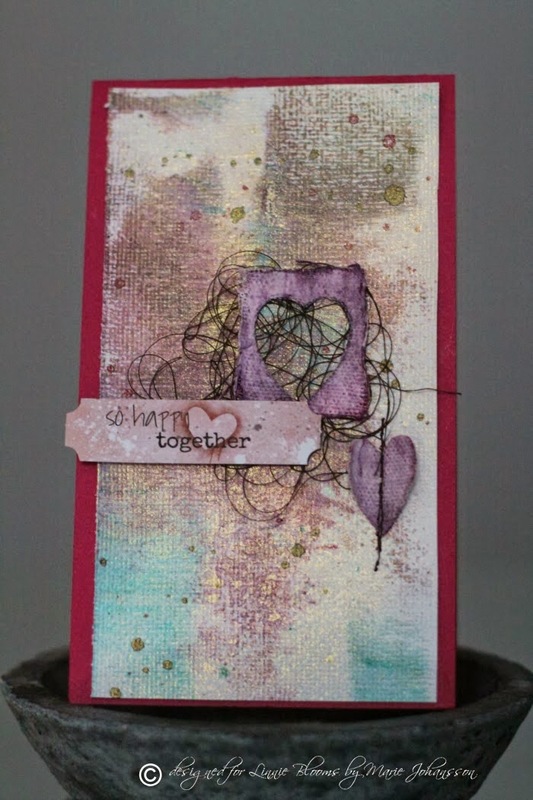 For instance - a use gesso and splatters of paint on a romantic card. 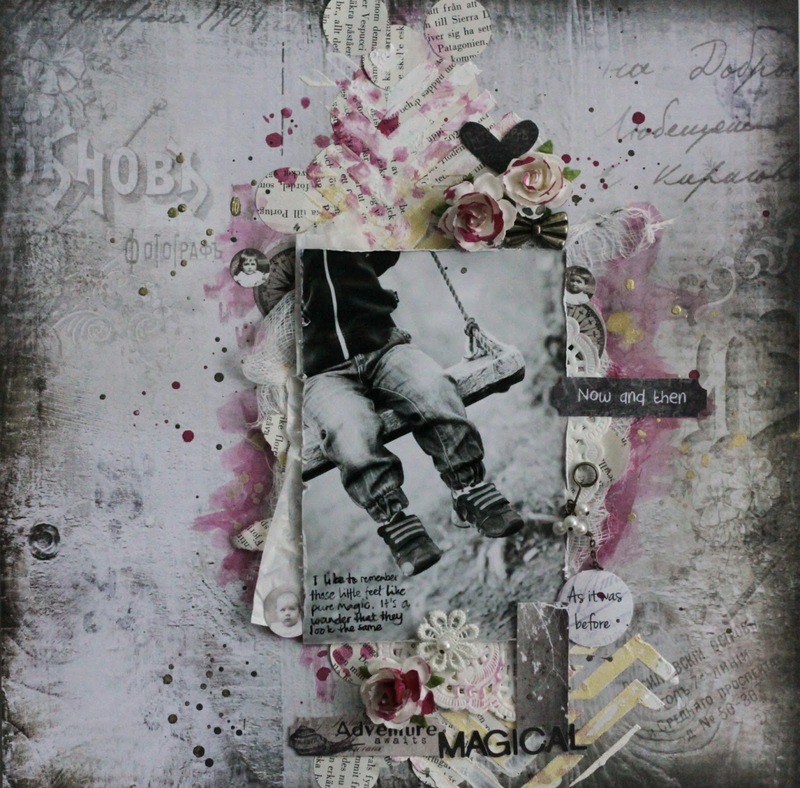 Or I use fabric mixed with gesso, ink, stamps and stencils on a layout. I have always created in some way. I think it´s part of my heritage. My mother worked as a techer in sewing, embroidery, knitting, basked painting etc when I grew up. My two grandmothers have knitted, made quilts or clothes. It´s a natural part of my life to create. I just do it without even thinking of it, if I don´t scrapbook I knit or sew. Or I repaint the living room. Later in life I have become aware of that it is an incredible gift to be creative. It gives me distance and complentation from my hectical life in general. Having two kids and working full time as an Intensive Care Nurse is not relaxing at the opposite. Well, now let me present 3 ladies that has inspiered me in my creativity. The first lady is one of my former collegues from the Allt om Scrap enzine - Maja Stokk. She has the most amazing feeling when it comes to use flowers and paint in a elegant way. Her layaouts feels like paintings hanging in a gallery to me. I fell in love with Magda Bolinskas messy and arty style a couple of years ago when I saw a layout by her in a magazine. I love how she just seams to place things randomly on a piece of paper, and it still looks very well tought trough. The last lady I will present is a really dear friend of mine. She is crazy crative in all fields. The knows how to fix the car, build a cupboard, set up a garden and she makes the most amazing altered items. I´m talking about Annika Hedberg. Please visit these ladies and give them your love! Love you Marie and your beautiful art/soul. Someday we will hang out IRL and play. Beautiful projects. Your mixed media card has lovely layers and textures. 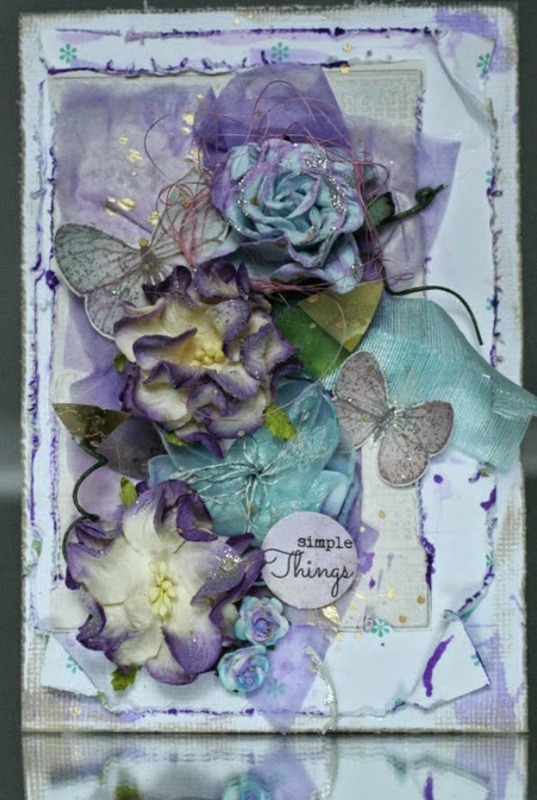 Thanks so much for responding to The Mixed Media Card Challenge!